And, surprise, I kind of hate it. I’m using stock images from the product page because I’ve already returned this thing. I really like the concept of this device, but in practice, it’s not ideal. 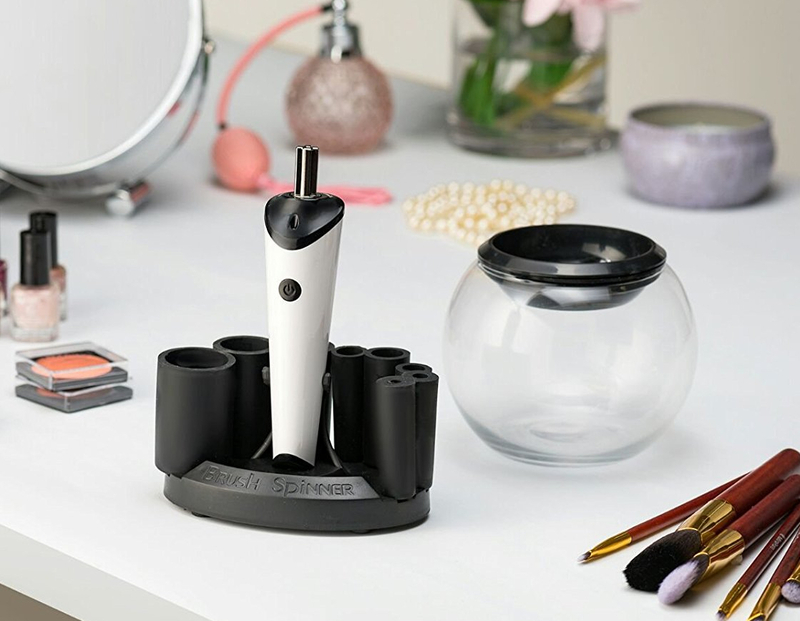 The handle is rechargeable and comes with a decent charging stand that holds it and the rubber sleeves that you attach to your brush handles. Most of my brushes fit, but some better than others. The problem with the sleeves is that they’re made from a weird, sticky rubber, so literally, everything sticks to them. The brush handles, dirt, hair, crumbs, anything they come in contact with ends up stuck to them. And they don’t rinse off. When you’re attaching them to the handle you have to leave a little bit of space or the sleeve will stick and only spin on the highest setting. It seems like a design flaw. Speaking of design flaws: the bowl. It’s glass, which is kind of nice I guess, but I’m a klutz so I don’t know how long it would have lasted without being dropped. The plastic lip thing keeps water from splashing out everywhere but it also makes it kind of hard to get the dirty water out, which needs to happen after cleaning almost every brush. 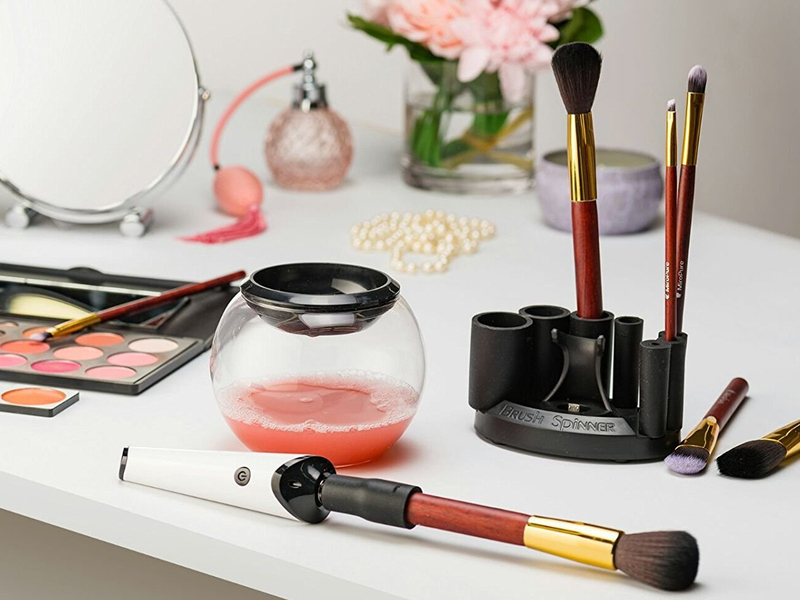 Unless you want to clean your brushes with dirty water, which is kind of pointless. The kit I got included brush cleaner and I ended up using way more of it than I expected because I was changing the water so often. This made the whole process kind of time-consuming thereby negating the whole reason for my purchase. If I didn’t own so many brushes and washed them more often it might not have been a problem, but I do have tons of brushes and I don’t wash them very often. I ended up getting frustrated and just gave up after washing a dozen or so brushes. The kicker: the brushes I did wash WEREN’T EVEN CLEAN. This was the part that sealed the deal as far as me returning this device. I didn’t realize it until the brushes had dried, but most them still had makeup residue and none of them felt clean. They felt weirdly greasy and sticky and I ended up washing them all over again. it made me really mad. So, in short, I wouldn’t recommend purchasing this. I read a post from a makeup artist who said to just wash brushes in plain water. Oh for real? I’ve never seen that. Now I need to go search. I know exactly what texture that rubber is and its THE WORST. Amen sister. Feels gross, looks gross, basically the worst material ever invented.